What remains today of Buffalo’s Humboldt Parkway is an ordinary stretch of sidewalks and city streets, divided by the Kensington Expressway. Decades ago, it was a tree-lined parkway connecting major parks of the Olmsted system. On Saturday, a community coalition once again led the charge to restore the parkway design. 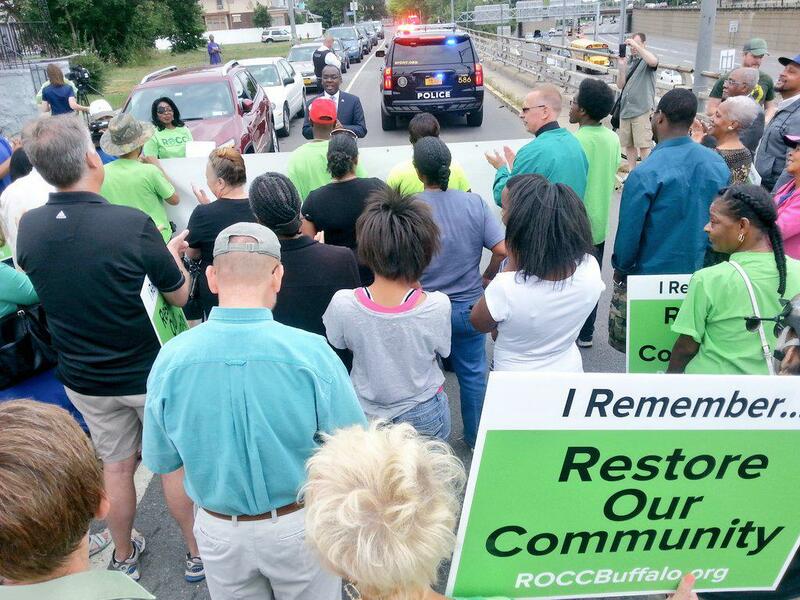 The Restore Our Community Coalition organized a march along Humboldt Parkway to the Buffalo Museum of Science to spread awareness of the desire to see the parkway restored. Executive Director Karen Stanley Fleming says their message was that it’s time for a change. Fleming says money has been set aside with the department of transportation for half a decade, and within that time two different feasibility studies have been conducted by the University at Buffalo. One illustrates the design of a deck above the Kensington Expressway, turning a stretch of it into a tunnel with the parkway above. The other looks at the economic value. According to the Coalition, that there are 21 other cities in the U.S. where parks have been built over expressways to reconnect communities and build green gathering spaces. If the deck is going to happen, Fleming says it’s got to be a federal-level project. That’s why the coalition has gathered support from city, county, and state legislators, in hopes of catching the eye of federal officials like Senator Charles Schumer. The coalition hopes to get federal attention before the year is over, but recognizes that any large-scale progress could still be years away. Fleming says the movement is by no means in its beginning stages, noting that community activists and residents have been advocating for the change since the 1970s. There is a renewed energy and spirit when it comes to reevaluating Buffalo’s high speed roadways that disconnect us as a city, and block us from accessing our waterfront. For some people, the battle to heal our city from the harms of urban renewal run deep. Deep scars that tore communities apart, and left trails of disinvestment and blight in their wake. 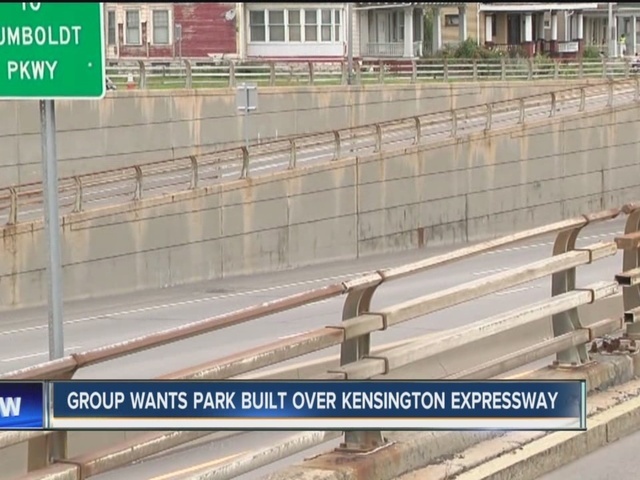 One organization in Buffalo set out some time ago to address the issues and convince The City to reverse the damage wreaked upon Humboldt Parkway. Today the message of Restore Our Community Coalition (ROCC) is louder and more clear than ever. On June 12, 2015, from 2-4pm, ROCC will be taking that message to the airways, in the form of a Radiothon at WUFO 1080 AM. There is no better time than the present to right the wrongs of the past, and to restore what was lost – Olmsted’s tree-lined Humboldt Parkway (from Delaware Park to Parade Park – now MLK Park). “Residents were shocked when the construction began. What was left was a disconnected community that has witnessed economic and physical decline in addition to health and safety concerns,” states Stephanie Barber Geter, Chair of Restore Our Community Coalition. This is not a new battle. This is the same battle that the community has tirelessly been fighting all along. ROCC has attributed much of the newfound momentum to a spirited generation of Buffalonians that are spearheading renewal projects all over the city. The construction of Route 33 was a mistake, there is no doubt. But there are cities throughout the world that made similar mistakes, and many of those cities have done what many thought was impossible. In order to harness the newfound energy, and direct it in the appropriate places, ROCC is in need of funds that will help to bolster the movement. By leveraging an ongoing “I Remember” campaign, and launching new fundraising mechanisms (including the Radiothon), ROCC believes that there is nothing that can hold this community back. On Saturday, April 18, 2015, the Restore Our Community Coalition (ROCC) will honor the ladies of the early movement to protect and restore the Humboldt Parkway neighborhoods. The decision to destroy one of America’s tree lined Olmsted parkways and replace it with an expressway was introduced over 60 years ago. This planning decision has resulted in decades of decay, an economically disconnected community and decline of a once vibrant, clean, green, and beautiful neighborhood. Why ROCC Legacy Tea? Women History Month was the inspiration. The Committee reflected on the long journey to seek answers and social justice for the community destruction. The ROCC Committee wanted to begin a tradition of honoring the legacy of the female advocates of the movement during Women History Month. “These ladies are the connection from our past to our future”, stated Karen Stanley-Fleming, the Executive Director of ROCC. ROCC would like the dedicated community advocates to know that their work have not been forgotten. “We remember the passion and work to restore the Olmsted vision of a vibrant, green community space and to remediate the devastation caused by the construction of Route 33. The new Buffalo should include a restored and reconnected community”, stated Stephanie Barber Geter, Chair of ROCC. Reposted from the GoBike Buffalo website. It has been about 60 years since Humboldt Parkway was dug up in exchange for the Kensington Expressway (the 33); this destroyed the Hamlin Park neighborhood by cutting it in half, killing connectivity, and reducing the neighborhood vitality. Well, the residents of Hamlin Park have had enough. A coalition aptly named Restore Our Community Coalition is spearheading an effort to make the 33 into a tunnel, to reestablish Humboldt Parkway on top of it and to return the neighborhood back to Olmsted’s original vision. This would ultimately reconnect the communities that were so wrongly destroyed as a result of the 33. We look forward to supporting this effort and working with the Coalition in the future. For more information on this campaign and the Restore Our Community Coalition, check out their website. One of the few existing remnants of the original Parade Park, which would eventually become Martin Luther King Park, has a chance of returning to its original foundation. Seen in The Buffalo News. The two-story barn, a block and a half south of Martin Luther King Jr. Park, is easy to overlook. The timbers are worn, the yellow paint faded and its days as a working barn long past. But despite the neglect, the building at 350 Mills St. – its Stick style architecture still structurally sound despite some rot at the base – has historic value beyond its 19th-century birth. And some park aficionados say it’s time to move the building to its original home in the park, while restoring it for contemporary use. “It’s not just a barn, it’s part of the park system’s grand past,” said Tony James, an architect with the Buffalo Olmsted Parks Conservancy. “It’s the earliest park building surviving in the city, and unfortunately it’s not in one of the parks, and we want to get it back in the parks. “The barn’s also significant architecturally, because it’s the only Calvert Vaux building left in Buffalo,” James said. Vaux was an English-born architect who teamed with landscape architect Frederick Law Olmsted in 1869 to create the Buffalo park system of parkways and traffic circles. The men earlier designed Central Park and Brooklyn’s Prospect Park, and during Vaux’s 40-year career in New York City, he designed two of that metropolis’ most visited attractions – the American Museum of Natural History and the Metropolitan Museum of Art. Among the Buffalo park buildings Vaux designed was the decorative Parade House, completed in 1876 in the Parade, MLK Park’s original name, where the Greenhouse and brick Shelter House are today. The wooden Parade House burned down the following year, but was rebuilt in similar fashion by architect Cyrus Porter. The barn was part of the complex, and it was moved to Mills Street in 1897, several years before the Parade House was torn down following the park’s redesign. The Parade House was seen at the time as being too expensive and time-consuming to maintain, James said. “The Parade House was the most elaborate structure Vaux ever designed for any park. It was made of pine, which is why it burned, was elaborately carved and decorated, and painted very bright colors,” said scholar Francis R. Kowsky, author of two books about Vaux. The Parade House was designed for everyone, reflecting Olmsted’s and Vaux’s view of parks as a place for socializing without regard to social class despite the Gilded Age they were in, Kowsky said. The building, which included a boisterous beer hall with music and dancing, came to be especially popular with the German community, while frowned on by the Anglo-Saxon Protestants on the West Side. “Returning the barn to the park would be a nice reminder of that great building that was here,” Kowsky said. The barn was identified by Martin Wachadlo, a local historian who came upon it while working on a historic survey of the Broadway-Fillmore neighborhood about 10 years ago. “When I saw that building, I thought this doesn’t belong here,” Wachadlo said. He speculated the barn could have been in the park as part of the Parade House complex, and it was confirmed when a building with the same dimensions was found there using an old map of the city. The map also showed a horse shed attached to the barn. Wachadlo, upon further inspection, found a post on the barn’s right side where the shed would have been attached. Researcher Monica Rzepka eventually discovered the city permit that recorded when the barn was moved out of the park in 1897, at a time when the large circular basin – now a splash pad – was installed and the park’s name was changed to Humboldt Park. Wachadlo said he hopes the chance for the park to reclaim the building won’t be missed. “We talk about the parks system being so important. Well, this is the only opportunity for the people of Buffalo to have an original parks structure in our parks system. It would be a shame for it to be lost, especially now when there is such a greater appreciation for our architectural heritage,” Wachadlo said. The barn, 25 feet deep and 36 feet long, is being used for storage by a landlord who has agreed to sell it for a reasonable amount, James said. But there are a number of additional costs that make bringing the barn home an expensive proposition. The Conservancy received an estimate in 2012 of $160,000 to buy and move the barn to the park. The cost rose to $617,000 to also restore the structure and build a replica of the former horse shed, James said. A garage door apparatus installed a few decades ago must also be removed. The long-term plan would be to use the barn for employee training in the summers, provide office space for the park superintendent that currently doesn’t exist and to rent it to the community, James said. Tim Tielman, executive director of Campaign for Greater Buffalo, suggests buying the barn and nearby land, and converting it into park use at a fraction of the cost. That would speed up the process of saving the barn and putting it into the Buffalo Olmsted Parks Conservancy’s fold, without precluding the move at a later time. But Stephanie Crockatt, the Conservancy’s interim executive director, said acquiring the barn is not a priority because of the cost and the many pressing needs the parks system is confronted with. She said the Conservancy could envision working with historical and preservation groups to acquire and move the barn, but someone other than the Conservancy would need to lead the charge. “It’s a really worthwhile project, but it’s just a bit outside of our reach,” Crockatt said. Chairperson Stephanie Barber Geter reminds us how important it is that each and every Buffalo neighborhood participates in the city’s redevelopment. Seen in The Buffalo News. The “I Remember” campaign by the Restore Our Community Coalition is more than a nostalgic nod to a Frederick Law Olmsted masterpiece landscape connecting Delaware Park and what was then called Parade Park (now Martin Luther King Park). Even as we create a community memory album at roccbuffalo.org, the “I Remember” campaign is a call to action for reclamation of Humboldt Parkway to create One Buffalo. We must reconnect a community left out of Buffalo’s economic renaissance. To restore the parkway would bring almost 1,000 construction jobs and create a fitting gateway to downtown Buffalo and the medical corridor. This part of Buffalo’s African-American history is painful. As the 1950s turned into the ’60s, the tree-lined parkway was gutted to build the Kensington Expressway, just as the neighborhood was becoming home to some of the city’s most prominent African-American families, such as Robert Coles, an architect who defiantly designed his home with its rear to the expressway, or the Waltons, who both worked at the Chevrolet plant, where Mrs. Walton was the plant nurse, or the Singletons, whose father was a union leader at the Bethlehem Steel plant and a real estate agent. Those residents fought, but lost, the battle when public officials presented a plan to expedite access to downtown for suburbanites. Powerless to prevent their property values from plummeting, and defenseless against the property damage caused by the blasting and highway construction, a remnant of those residents remain today as owner occupants amongst absentee landlords meeting the demand for student housing. Construction of the Kensington is a shameful part of Buffalo’s history, environmentally, economically and socially; but to rewrite that history, we must first acknowledge the wrong, and then prioritize funding for the restoration. A restored and reconnected community is important to the growth of the One Buffalo, the New Buffalo, which should include vibrant and healthy communities for all. A recent interview conducted by Mike Puma was featured in the April 2015 edition of the Buffalo Spree Magazine. Picture the Hamlin Park neighborhood in the winter of 1959. As a light snow falls, resident Donnee Hill steps out of his house, feeling the fresh snow crunch under his feet. The mighty elm trees overhead seem to go on forever and create a snow-covered canopy as far as he can see. As he takes a moment to gather himself, he realizes that Humboldt Parkway, where his family has recently bought a house, is one of the most beautiful streets he’s ever seen. Looking back on that day and so many others like it, Hill remembers the paradise that once was Humboldt Parkway—and he’s not the only one. A movement that has been decades in the making—to restore Olmsted’s vision for his longest and grandest parkway—is gaining traction in Buffalo. Dedicated community members who want Humboldt Parkway returned for future generations to enjoy have organized as the Restore Our Community Coalition. Tell me about the Restore Our Community Coalition (ROCC)—what are you trying to achieve? Clarke Eaton (founder/board member): To bring back to the neighborhood what was here before the expressway destroyed Humboldt Parkway. I’ve lived in the community for the past forty-eight years, and, like any person who loves their home, I want to see the best for it. I raised my daughter here and she raised her son here. This is something we want for future generations. It’s time for us to go back and restore the beauty of the parkway. I even remember the days we could pet horses still using the bridle path. Stephanie Barber-Geter (board president): ROCC was formed five years ago, but Clarke has been involved in some form to restore the parkway as far back as the 1970s. I remember as a kid living downtown on Eagle Street when they took all the land, moved everybody, and built the Frederick Douglass Housing Projects, which was a big calamity. I remember a woman named Margaret Strasner, who had to move because of the project and moved to Humboldt Parkway. Unfortunately, with the expressway coming only a few years later, she went from one calamity to another. We’re still dealing with the effects today and need to fix it. We’ve been reaching out to the community with our “I Remember” campaign, where residents recall the beauty of the parkway so we can have an identifiable face for the movement. What’s the solution that ROCC has come up with to restore Olmsted’s vision? CE: We thought we would turn and look at the economics of the situation. A restoration of the parkway would be beneficial on so many levels. It would create jobs and help maintain and improve the community, while, in turn, draw more people to the neighborhood. SBG: We looked at every possible fix and we believe that covering the expressway is the way to restore the community and fix the residual effects it created, like the loss of business on Fillmore and Jefferson. It’s not our intent to disturb the flow of traffic with our solution. We don’t propose filling it in; we don’t think that makes sense. Capping the expressway allows us to reconnect the community, while still allowing easy access to downtown. Why not just fill it in and be done with it? It seems like an opportunity to fix systemic problems of sprawl in our region. SBG: For months, our meetings were just focused on how big this could possibly be, but we decided to have a more specific focus with the ultimate goal of restoring the parkway in the most feasible and least disruptive way. There was a big concern that removing the expressway would result in significant traffic on our streets and many folks along Humboldt Parkway wanted us to avoid that. We believe that filling it in places us too much at a disadvantage for even getting it started. KSF: The design report that was produced by Professors Hata and Warren at UB was to first and foremost reconnect the neighborhood, almost like pulling up a zipper. If we fill it, and create heavy traffic at grade, then we’ve not closed the zipper and effectively reconnected the neighborhood. This would be a pretty big project; what would be the first step? SBG: Phase one would see the expressway capped from just south of the science museum all the way up to East Ferry. It would actually extend the parkway beyond where it was originally supposed to stop, but it’s an expansion on Olmsted’s original vision. What about the rest of the parkway, since it went all the way to Delaware Park? SBG: Phase two is more ambitious, and the groups we’ve had look at this have told us we can do some very interesting things with it. Because the expressway eventually becomes grade level past East Ferry, it would require some excavation. A part of that idea could include an extension of light rail that would allow people to get between downtown and the airport. That change in grade is due to the Scajaquada Creek being buried, which presents a challenge. There are a couple of thoughts about how to deal with it, and other projects have run into the same problem, like the big dig in Boston. Speaking about the big dig, how much is this going to cost and where is the money coming from? SBG: We’ve been working with a number around $500 million. It’s a lot of money, but we believe the money is out there within the state and federal governments. Who are your political and community partners in this endeavor? SBG: We’ve got a lot of politicians already involved and interested, thanks to the efforts of our executive director. The churches along the expressway have been very supportive, our various community organizations have been very involved, and all of our elected officials. We certainly have support from our Assemblywoman Crystal Peoples-Stokes, Senators Kennedy and Schumer, and Congressman Higgins. The mayor and council even passed a resolution in support of the project. There are so many others like the people involved in removing the Robert Moses in Niagara Falls; we have a lot of people who want to help. Although Sean Ryan doesn’t represent the district, he has been a friendly ally. I hope he’s able to keep the Scajaquada upgrade movement alive for the Parkside community. Speeding through a park just isn’t right, and something has got to give. Do you think this project can have broader implication outside of Buffalo? SBG: I think in a time when the president and elected officials are looking for infrastructure projects to put people to work, we look pretty good. The shelf life of the current expressway is fast expiring and it has serious issues that will need to be corrected eventually. A project like this is already necessary ,and employs a major number of people in our community for a long time. At this point in Buffalo, the city is coming alive and it should be coming alive for everyone. KSF: This project could generate over 950 construction jobs for the entire course of work, which would be five to ten years. That number doesn’t include potential additional employment for infill housing, rehab work in the neighborhood, and improving Jefferson and Fillmore businesses. The potential ripple effects of this project are huge. Mike Puma is a project manager at Preservation Studios.